What’s coming up in the future, insha’Allah, with Baba Ali and a little bit about boyfriend/girlfriend problems. No, I’m not beating a dead horse to death with a stick. I’m beating a dead, lame duck to death with a shoe. Last week we shoed showed you the video where the Iraqi Journalist Muntadhir Al-Zaidi threw his shoes at the soon to retire president of the US. Now, you probably have also heard about all the action that’s being taken to free this guy from custody, since many argue he only did what everyone in the US and the rest of the world wanted to do. We’ll here’s an idea… in solidarity with Muntadhir Al-Zaidi this facebook group has an interesting idea. They are encouraging people, who wished they could do what Al-Zaidi did,to send a pair of their old shoes to the basting duck. They even include the address. Unfortunately there may not be enough time to reach him in time for the holiday and his boot from office. From one of our listeners and visitors of Slam Ottawa, [viewfromsaudi.blogspot.com] comes a beautiful poem about the journey of a lifetime. You probably have heard of last years top videos where the blonde “US Amaerican” Miss South Carolina 2007 “everywhere like such as and” made a mockery of herself on live television. Now, as Muslims we do not discriminate against any one group based on their ethnicity, religion, race, or the colour of their hair. So, I do not condone anyone who makes fun of blondes and generalizes that they are all “dumb”. It’s just not True. BUT! Recent evidence does show us that Miss South Carolina suffers from not blondeness, but form sever post Pageant Brain Fatigue Syndrome and it affects most women who participate in pageants. In a more recent case, it seems to have affected another Pageant participant; Miss Pakistan, Natasha Paracha. She recently, with all cool and calm, condoned the Mumbai Attacks in an interview with Anna Coren. con·done [kuhn-dohn] : to regard or treat (something bad or blameworthy) as acceptable, forgivable, or harmless. 1. to disregard or overlook (something illegal, objectionable, etc). 2. to pardon or forgive (an offense); excuse. Poor Pakistan. Your self-proclaimed ambassador may be causing more tensions than easing them. She wants all Pakistanis to condone these attacks. It also seems like whatever it is that Natasha has may have infected Anna Coren, since she made no attempt to correct her guest, or at least inquire about her views and her call to Her Nation to condone these attacks. “On a Global Sphere”. 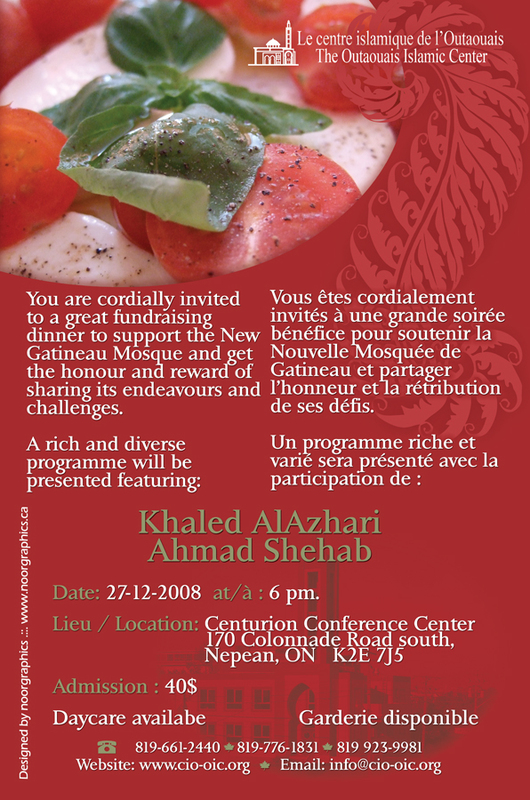 Gatineau Mosque is arranging a fundraising dinner for their upcoming installment. 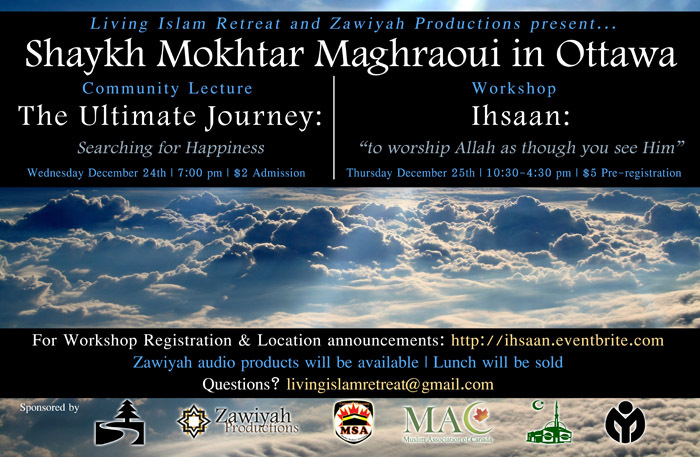 DO NOT miss this event which will take place on December 27 in Ottawa. Click on the flyer to see the details. When: Wednesday, December 24th 7:00 p.m.
Thursday, December 25th 10:30 a.m. – 4:30 p.m.
Friday, December 26th 12:30 p.m. When less is more, and more is less. well-respected and renowned Muslim Scholars in North America. empower Muslims on their spiritual quest. 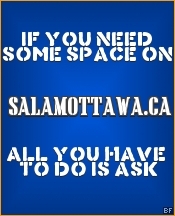 We’ll look back at the year with Salam Ottawa. We’ll talk about all the new and exciting things lined up for 2009. The appalling killing of Robert Dziekanski after he was jolted by a Taser and restrained by four Royal Canadian Mounted Police officers at Vancouver International Airport last month. Cleary Avenue runs north off Richmond Road, 1 km east of Woodroffe Avenue. Eid Al Adha is fast approaching if you intend to make Adhia ( Zabeeha) for this year, you can do it through IRFAN-Canada Zabeeha program or through Human Concern International. Both of these organizations have offices locally in Ottawa. Just incase you were wondering about the RIS conference as I was, it is returning InshaAllah at the end of December at the Metro Toronto Convention Centre. Given by: Sheikh Abdurrahman Al-Hejazy, the Deputy Imam of the Main Ottawa MosqueWhen: Every Friday at 7:00pm Where: At the Main Ottawa Mosque, 251 Northwestern Ave.